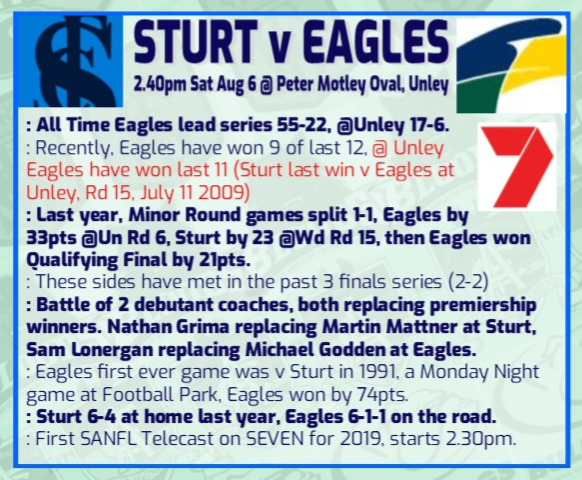 Will be a tough battle for the Eagles today even though their record at Unley Oval is excellent. Missing from probably our best side are: Toumpas, Lonergan, Sharrad, Nick Hayes, Giuffreda, Guilhaus, Firns and possibly Gray and Schmusch. West must be competitive today or his future looks bleak. Very impressed with young Jackson Mead in the reserves and hope he gets a go later on in the season but U18 commitments will possibly curtail this. I think the league game will be a hard game . I’m hoping Pickett comes in his 6 goals in the seconds last week with speed and leaping abilities were impressive.